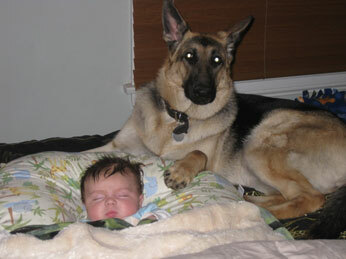 German Shepherd, Caspian, is a great babysitter! Caspian is a great babysitter for a German Shepherd! Caspian is our 2 year old female German Shepherd, who loves to watch over "her new baby" Mason. She was rescued at 8 weeks old-She was found in a cardboard box. She now is spoiled with lots of fun toys and treats! She travels with us (her family) everywhere we go! She also loves her new job as a mommy! Hello Megan, and thank you so much for sharing your great story about your wonderful babysitting German Shepherd Dog Caspian. And what a great picture. I once had a GSD that was the best babysitter ever - she was so patient with babies and young children and you can believe those babies she was "watching" with us were the cleanest babies on the block - that's for sure. And I'd like to take the time to say thanks to all of our German Shepherd loving visitors for reading all these great customer stories right along with us. And if you get the chance, please come back often to see what else is going on in our developing German Shepherd Dog community. BTW, please tell us also exactly what you think about the above story, or any of the other stories shared with us by our readers by leaving some interesting comments in the feedback area below. It's pretty easy to do - just click on the link in the area that says "Click here to post comments". And thanks again.